ERR reader Rob sent me some great scoop this week. Rob let me know that he attended a taping of Million Dollar Password hosted by Regis Philbin and Rachael Ray turned out to be the celebrity guest! Rob says she "was tons of fun and chatted a lot with the audience, she was really nervous and really hilarious. She played against Neil Patrick Harris." He thinks the episode will air this spring, so keep an eye out! In other news, I was recently tagged by Patsy of Family, Friends and Food for two lovely awards (which you can check out at the bottom of this post). In return, I'd like to pass along the love and give the same awards (and tag) to my friend Leslie of Houses, Couches, and Babies, my buddy Cate of Sweetnicks, and Ali of Divine Domesticity. Each of them has recently inspired and/or helped me lately, so thanks to each! Debby at Everything on a Waffle is having one of her recipes included in one of Rachael Ray's next cookbooks, Yum-o! The Family Cookbook, which will benefit the Yum-o! Organization. The Passionate Baker made Lime Chocolate Almond Shortbread Tart from Every Day with Rachael Ray. Despite her checkered past regarding Rachael Ray, Maven of The Makeshift Cook uses her Chipotle Mac and Cheese recipe with regularity. Blogging Project Runway alerts us to a podcast with Kevin Christiana, who talks about working on Rachael Ray's talk show. Jenny Bakes features a recipe from Rachael Ray's magazine for Oatmeal Cookie Pancakes. George Ellwanger of the Atlanta Journal Constitution admits his jealousy for Rachael Ray. 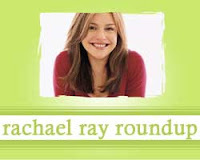 Tracey Thompson of Foodie Obsessed discusses Tom Colicchio's recent appearance on Rachael Ray's talk show. Edwardallen of This is Jeopardy has some very interesting thoughts about the reactions to Rachael Ray's decision to throw a party at SXSW. Erin of Erin Cooks tried made Shamrock Shortbread after being inspired by a recipe in Rachael Ray's magazine. Kath Eats Real Food shares some thoughts on a recipe for Poor Man's Gumbo from Every Day with Rachael Ray.